As soon as Kia Kobad ascended the throne of Iran, he realized that lasting peace could only be established if the Turanians were driven out of Iranian territory and taught such a hard lesson that they would not dare to attack Iran again for some time. Kai Kobad therefore summoned the nobles and warriors of Iran to his court and laid out his plans to drive the Turanians out of Iranian territory. If a mountain of iron were to just hear the name of Afrasiab, it would turn into a sea of water! Despite these warnings, Rostam is adamant and finally has his way. Now when the armies met, Rostam came forward and demanded a battle with Afrasiab. Seeing the very young Rostam for the first time, and unaware of his divine power, Afrasiab scorned him and rushed into battle hoping to finish off the encounter in a few minutes. But Rostam! And Raksh! All the anger that Rostam had contained in him for such a long time against Afrasiab exploded and he came down upon Afrasiab like a ton of bricks. As a seasoned warrior with decades of battle experience, Afrasiab immediately realized that this was no ordinary warrior. 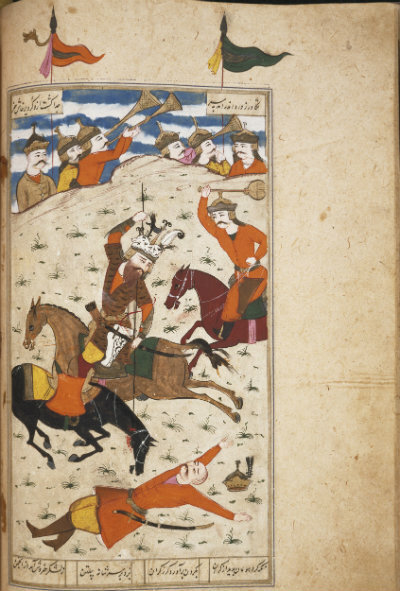 As the fought fiercely, Rostam rushed forward and taking Raksh very close to Afrasiab’s mount, caught hold of his belt and with a mighty roar lifted Afrasiab from his mount and smashed him to the ground. It was Rostam’s intention to throw his net over Afrasiab and take him prisoner in front of Kai Kobad. But the moment the Turanians saw that Afrasiab had been dismounted, they fell upon Rostam in their thousands. As they rained their weapons onto Rostam, he desperately tried to fight them and at the same time keep his grip on Afrasiab. To do both was impossible and the wily Afrasiab managed to slip away from his hands, but had to leave behind his crown in Rostam’s hands. 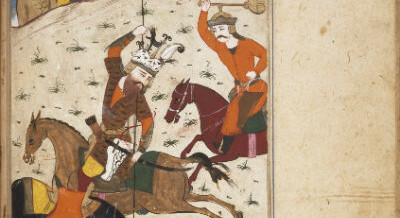 With one hand holding the crown and the other his sword, Rostam slaughtered hundreds of Turanian warriors and managed to ride back to his camp with the crown, but very angry that Afrasiab had slipped away. A distraught Afrasiab went back to Turan and complained to his king that despite their best efforts, every now and then, the Iranians managed to come up with the bravest of warriors. This new boy called Rostam would surely spell trouble for the Turanians in the future! Little did Afrasiab know how true his words were to be! Meanwhile seeing the routing of his own army, Afrasiab slyly suggested to Pashang that they should call for a truce so that they could rest and add further troops before mounting a fresh attack. Now Pashang wrote a very sweet letter to Kai Kobad asking to let bygones be bygones and why they should fight over something that had happened years ago, etc. Kai Kobad himself was eager for the fighting to end so that peace and prosperity could once again reign in Iran and the years of hardship be over. Hence he accepted the truce offer, making sure that every inch of Iranian land was returned to them and the Turanians went back to the old borders of the Jayhun river. Now Kai Kobad ushered in a righteous and just rule throughout Iran. With good rains, prosperity increased and the lack of fighting made people happy and contented. Kai Kobad ruled for 100 years and then one day, announced in court that he was abdicating in favour of his son Kai Kaus. The King called his son and in front of his court and the nobles and warriors gathered there, gave him directions on how to run the kingdom, who to listen to, what to look out for and many other sound bits of advice. To bigaaneh khaanash ma-khaanash pesar! That son who fritters away the glory and fame of his father, cannot be called his son, rather he should be treated as an insane person. Now as Kai Kaus ascended the throne of Iran, the thought came to his mind that all the centres of Daevayasni and the great Lords of Darkness should be forever destroyed and peace should reign in his kingdom. In those days, one of the strongest fortresses of the Dismal Sciences and the Powers of Darkness was the region of Mazandran. Our Master, Ustad Saheb explained that the present day Mazandran province in Iran is not the same as depicted in the Shah Nameh. Rather at that time, the Kingdom of Mazandran lay somewhere near the Arctic Circle. It had a fearsome reputation as being the Citadel of Daevayasni and it had so far been left alone. I have more manly valour, Khoreh and wealth than King Faridun and Jamshid! When Zaal heard these words, he decided to let the matter rest. Kai Kaus gathered a mighty army, left the Key of the Kingdom in the hands of the warrior Milad and asked him to contact Rostam in case of any emergency. Kai Kaus then began the long march towards Mazandran. When the Lords of Darkness of Mazandran came to know of this venture of Kai Kaus, there was great anger and indignation. Many hundreds of years ago, in the time of the Pahelwan Keresasp, (who was the fore-runner of Rostam), an agreement had been entered into between Keresasp and Sapeed Dev – the head of the Lords of Darkness. The agreement was that the Lords of Darkness would not venture out of Mazandran under any circumstances. In return, Keresasp had assured Sapeed Dev that the Iranians would not harass them. This agreement had stood the test of time for hundreds of years. Despite Zaal’s advise, Kai Kaus chose to disregard this agreement and enter and finish Mazandran once and forever. Little did he know the might and power of the Lords of Darkness. As Kai Kaus and his army marched towards Mazandran, the King sent a forward party under the leadership of the warrior Gev to find out the nature of the cities of Mazandran and what kind of people lived there. Gev sent back fantastic accounts of the riches and wealth of the cities of Mazandran. Thus emboldened, Kai Kaus began his last mile march and entered the regions of Mazandran, thereby breaking the agreement between Keresasp and Sapeed Dev. Now as evening fell and Kai Kaus ordered camp to be set up so that dinner could be served and the soldiers rest before the next day’s attack, Sapeed Dev used his Powers of Darkness. As darkness fell, the entire camp area was attacked by a rain of large hail stones. As the army got up in fright and began running helter-skelter, a poisonous gas was released by Sapeed Dev which maimed and killed many soldiers and blinded all the others, including Kai Kaus. The Iranian army, or rather what was left of it was taken prisoner by Sapeed Dev and imprisoned in a very deep and dark cave. Sapeed Dev visited Kai Kaus and admonished him for breaking the agreement between him and Keresasp. Sapped Dev kept true to his word of not killing the King, but he gave very little rations to the prisoners, with a view that they would die of hunger and starvation. Now Kai Kaus realized his folly. After all he was the bearer of the Kyanian Khoreh! There, deep in the cave, Padshah Kai Kaus began to recite the Patet prayer, asking God for forgiveness and his false ego and folly. Finally, after many days, one of the soldiers of Kai Kaus managed to escape from the cave. Almost dying of hunger, the soldier made the arduous journey back to Iran over many months and came to the court of Kai Kaus and announced that the King had been taken prisoner, blinded by Sapeed Dev. When this news was heard there was great consternation in Iran. Milad immediately summoned Rostam and apprised him of the situation. Rostam conferred with his father Zaal as to what should be done. Now Zaal advised Rostam that he would have to go to Mazandran and free Kai Kaus. The normal route to Mazandran would take almost six months to cover. But there was a shorter route. Nobody ever took that route since it was beset by great difficulties and magic. There were seven different seals of magic on that route, each guarded by powers of great and superhuman strength. No mortal could ever cross this route. But Rostam was no mortal! Zaal advised him to take Raksh, gather his arms and proceed to Mazandran via the short route. Thus the stage was set for one of the greatest adventures of Rostam – the Haft Khan – the Seven Exertions. Click the image below to download the MP3 file of the talk. Extremely entertaining, just like a magical story. Thanks & Regds.